Notre gîte est situé sur la commune de Saint Michel le Cloucq, aux portes du Massif forestier de Mervent-Vouvant, le plus grand massif forestier de Vendée, lieux de nombreuses randonnées à cheval, à pied, à vélo, en vtt, et à proximité du Marais Poitevin, à découvrir en barque, à vélo ou en VTT. Nous sommes dans une région riche d’histoire, en témoignent les églises romanes, les abbayes de Nieul sur l’Autize et de Maillezais, les villes de Fontenay le Comte ou de Luçon, les petites cités de caractère comme Vouvant ou Foussais. La côte atlantique et ses plages de sable fin à la Tranche sur Mer, La Rochelle, les Sables d’Olonne et les îles de Ré, Aix et Oléron sont à une distance très raisonnable en voiture. Il vous sera possible de visiter les lieux réputés comme le Puy du Fou, le Futuroscope, les aquariums de la Rochelle ou de Talmont et la ville du célèbre Cognac. Cuisine indépendante intégrée avec lave-vaisselle, micro-ondes, four électrique, plaques en vitro-céramique. A disposition congélateur, lave-linge. Endroit charmant et très bien équipé. L'accueil est excellent, la propriétaire est charmante. Tout est ok, rien à redire. Un grand merci pour votre séjour ! We had a lovely, peaceful time staying at this charming character cottage. The owner lives nextdoor and is very friendly. The property is well looked after and had everything you need for your stay. It's set in a quiet, peaceful village but it's close enough to the region's attractions by car, including the wonderful medieval theme park of Puy du Fou. The beautiful path outside of the back door heads towards the local church and the village play park which our children enjoyed walking along. We would highly recommend staying here. Hello to the Enew family. Thank you for taking the time to post a comment on our cottage. I am delighted to know that you had a good week and that you enjoyed the atmosphere of our cottage. I hope you will have the opportunity to come back. The cottage is full of character but at the same time has all modern facilities. We really enjoyed our stay, the barbecue area is wonderful and very useful in all weathers. Chantal is a perfect host. The Photographs Do Not Do This Justice! 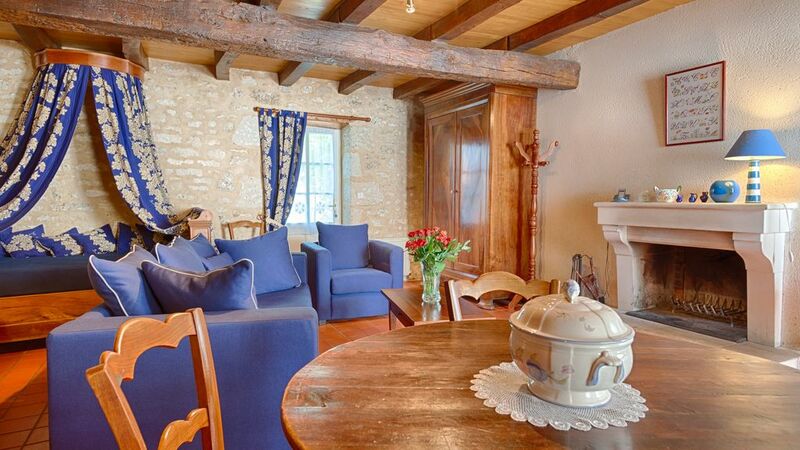 A traditional French village house, beautifully restored and extremely comfortable. This gite is to be recommended to all discerning gite holiday makers. Owned and run by a daughter and her mother who have spared nothing in making the old traditional village house into an extremely comfortable and well appointed place to stay. They were welcoming and generous with a bottle of wine, bread and well stocked fridge to get us going. Large garden equipped with tables, chairs, sun umbrella, bar-b-queue everything anyone could want. Very interesting places to see in the locality and places to eat. All in all a super place. beautiful property in pretty, peaceful location, ideal for exploring Vendee and the Marais Poitevin. An outstanding property in a quiet village location. Within easy reach of Fontenay-le-compte, Niort, Parthenay, La Rochelle, the Marais Poitevin and the coast beyond. We were made welcome by Chantal and her mother Suzanne, who live next door, the 2 houses having been in their family for many years.The gite has recently been renovated and modernised to a very high standard, and is a credit to them. Well appointed and comfortable (and refreshing cool inside on a hot day) we have no hesitation in recommending this property. Chantal voiced some concern, about the English not continuing to holiday in France following our 'Brexit' vote, but i think that whilst properties of this quality are available she need have no fears. Michael and Vivienne Wright. Thank you so much for your kind review, it was a pleasure to have you stay in our gite !. Booking Notes: Rental includes bed linen and bath towels. Linen change once a week. Welcome gift on arrival. The property is normally let from January-December. Prices include normal electricity expenses, water. Prices exclude additional consumption of electricity for heating and wood for fireplace. The rental price excludes end of stay cleaning. End of stay cleaning is the responsibility of the departing client(s). A supplement of Euros 60 may be paid to provide this service Deposit of 25% is requested at time of booking with balance due 4 weeks prior to arrival. Our securite deposit is Euros 250 Changeover Day: Rental is usually from Saturday to Saturday, arrival 16:00 hrs, departure 10:00 hrs. Out of season we can accept mid-week to mid-week rentals.